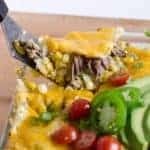 This Shredded Meat and Corn Enchilada Bake comes together quickly when you use leftover shredded meat and extra homemade green enchilada sauce. I love cooking a big batch of meat in the slow cooker, pulling it apart while it’s warm and tender, and then using the meat throughout the week. Cook once and eat on it all week is my kind of meal prep! This recipe is just perfect for any kind of meat that you have already shredded and in the fridge. You can use shredded beef, pork, chicken, or even lamb. 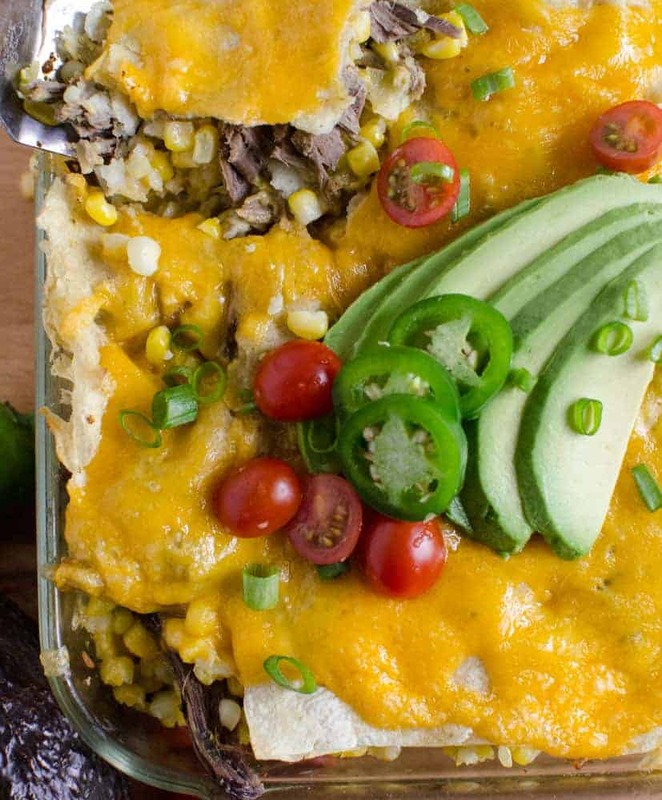 You can’t really go wrong with any of those meats in an enchilada bake with lots of homemade green enchilada sauce. If you aren’t cooking the meat yourself, this would be a great use from some extra rotisserie chicken. If your meat is already prepared, this dish really comes together in a snap. Instead of rolling a bunch of individual enchiladas, I just made this dish layered like a lasagna. 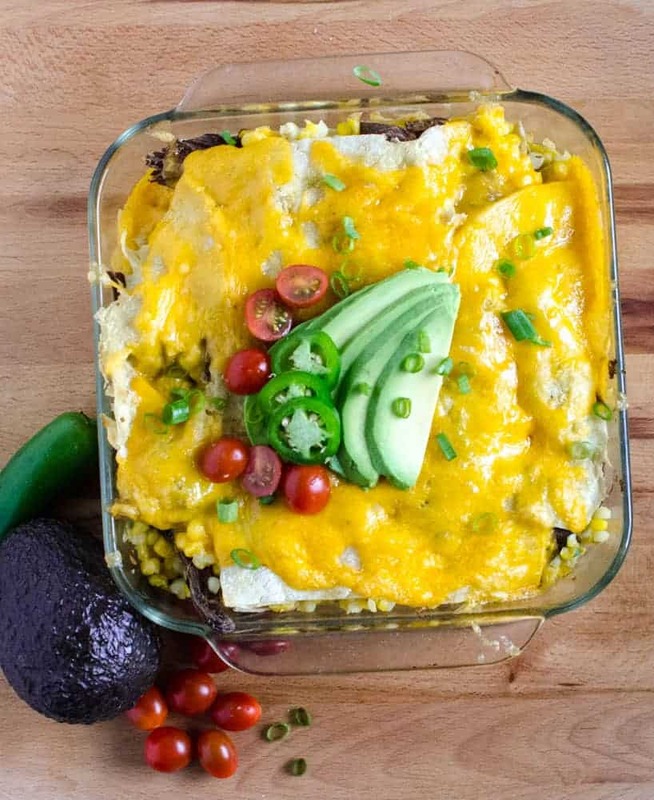 Some people call this kind of thing “enchilada stack” or “layered enchiladas” – no matter what you call it, it tastes greats and is easy to make. Craving more? Subscribe to Bless this Mess to get new recipes, meal plans, and a newsletter delivered straight to your inbox! 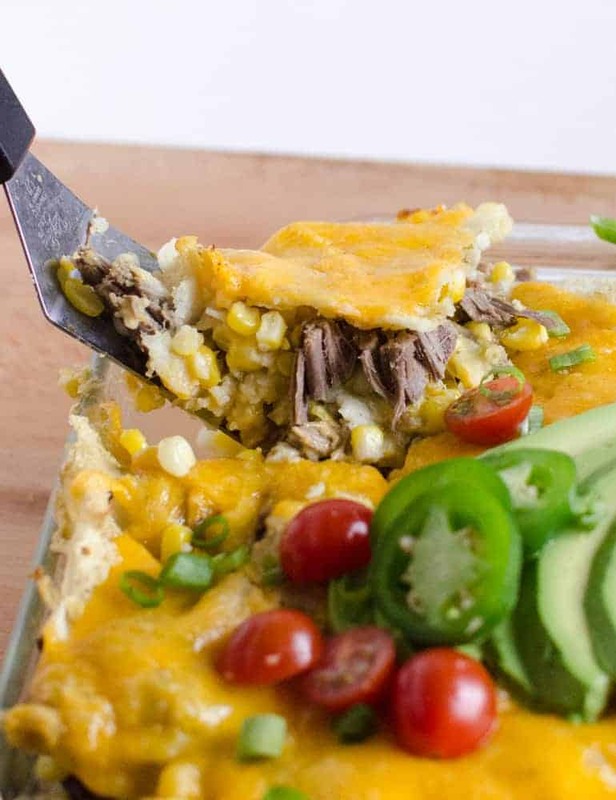 If you try this shredded meat and corn enchilada bake, let me know what you think! Leave a comment, pin it, and don’t forget to tag a picture #blessthismesseat on Instagram. I love to see your kitchen skills in action! 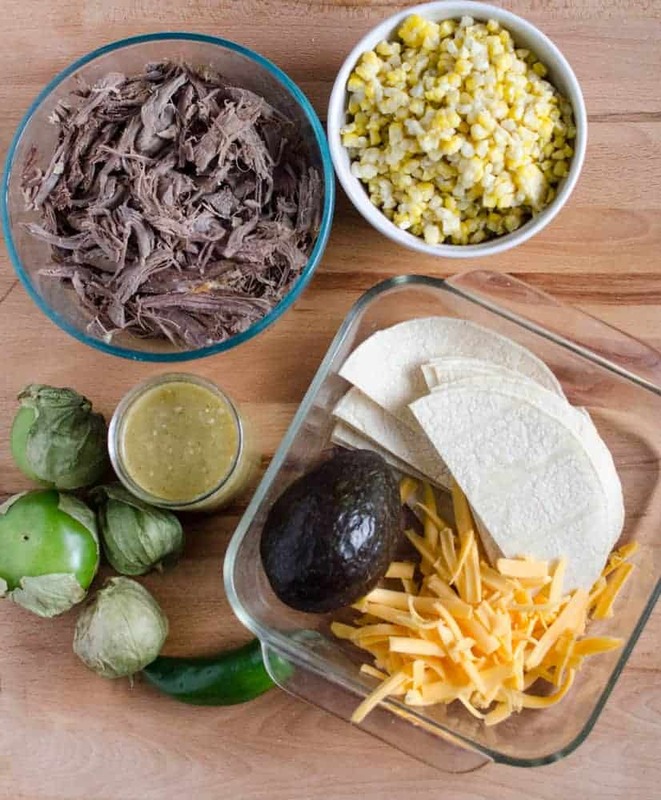 In a small bowl, combine the shredded meat, spices, and lime juice. Stir to combine and season to taste with salt and pepper (this amount will vary depending on how your meat was cooked). Pour 1/2 cup of the green enchilada sauce into the bottom of a 9×9 inch baking dish. Add a single layer of corn tortillas (use about 2 tortillas). Layer on 1/3 of the meat, 1/3 of the corn, then 1/4 of the cheese. Top with 1/4 of the sauce. 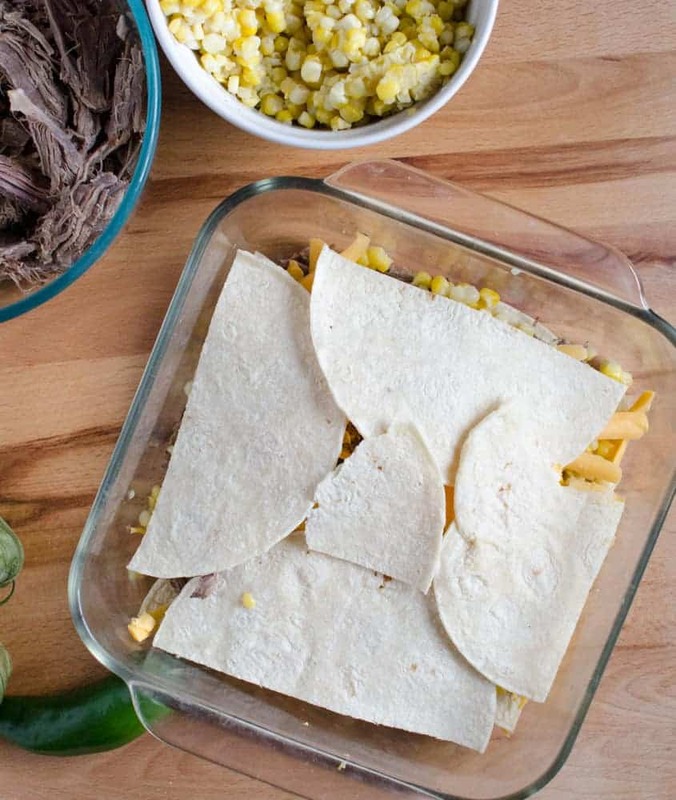 Repeat with more tortillas, meat, corn, cheese, and sauce. Add a final layer or corn tortillas and enchilada sauce, and then top the whole things off with a heavy hand of cheese. Cover the dish with aluminum foil and bake for 20 minutes. Remove the foil and bake for an additional 10 minutes. Let the dish cool for 5 minutes before serving with some chopped tomato, avocado, cilantro, diced green onions and/or hot sauce on top. Be careful to kind of “tent” the foil when you put it on so that it isn’t touching the cheese. This will help the cheese to not stick to it and then get pulled of when you remove the foil. Few things are sadder than wasted cheese. It’s easy, pretty, gluten-free, and WONDERFUL! I think more things in life should involve tortillas and cheese, and this is my effort to share that love with you. When you make that green enchilada sauce (it’s super easy, just throw everything in a blender! ), plan on a double batch. It stores really well in the freezer. I like to use it in this recipe but it’s also a great addition to traditional and white chicken chili. It packs a lot of flavor and is one of my favorite things to add to a pot of chili this time of year. You can throw just about anything on the top. Sometimes I’ll do this with avocado and tomatoes. It’s great with green onions, some black olives and sour cream, or you can add some shredded lettuce and homemade pico when you are serving it. It’s up to you – just use what you like best and have on hand. Thomas just finished putting the roof trusses on the garage yesterday! I think we have officially finished framing the exterior walls of our house, which feels so exciting. We still have roofing and sheeting to put on the outside, but all the outside walls are done! Now we get to think about our wrap-around porch, which is going to be a big project but dreamy when it’s done. We just ordered triple-pane windows that will be here the first week or December too. Slow and steady, but it is surely moving along. Wish us luck and enjoy this great dinner, from my home to yours. I made this tonight, and it got rave reviews! It was amazing. I slow cooked my beef in a can of green enchilada sauce, and it made the meat so flavorful. And my roast wasn’t as big as I thought it was, and I was also cooking for four elders, so I added 2 cans of black beans to the beef. It was delicious. So warm and savory. Definitely a comfort food. Oh, instead of enchilada sauce, I used a mild green salsa in the layers. It was tangy and slightly spicy. We all loved it. That sounds wonderful! And adding the beans to make it go further is a great idea, they go with this meal really well. So glad you liked it. I’m trying that green salsa trick next time, sounds perfect! I would love to make this. Lots of references to the green enchilada sauce but no recipe that I could see.